Meanwhile, this excavator is powered by the highly efficient EcoMAX Tier 4 Final compliant engine, offering superb productivity and reliability.The benefits of the JS145 series of tracked excavators don’t end there either. Before you buy a tracked excavator, you need to know they’re going to be tough enough to perform any job you ask of it. Fortunately, with a JCB JS145, strength and durability come as standard. We use Finite Element Analysis with extensive rig and endurance testing to make these 360 excavators last longer. A JCB JS145’s reinforced boom and dipper is made of high tensile strength steel, with single piecewrapper plates and internal baffle plates for long life durability. The high-strength undercarriage of a JS145 14.5 ton excavator is of a fully-welded X-frame construction for long-term durability even in the most demanding applications, and the rigid upper frame provides maximum durability and support. The turret on JS145 tracked excavators is then welded to both the upper and lower undercarriage frames, and stiff, durable doors provide further strength. It’s more important than ever to save money and time so it’s just as well that JCB JS145 tracked excavators are designed to make the most of both. A 92kN bucket tearout makes our JS145 excavators highly productive, and the JCB JS range quickhitch system makes attachment changing fast and easy. Simultaneous tracking and excavating is smooth and fast with an intuitive multifunction operation, and four operating work modes allow a JS145 14.5 ton excavator operator to tailor performance to any application. Auto, Economy, Precision and Lifting modes provide very different optimized settings. Auto-idle technology automatically reduces engine speed when hydraulics aren’t in use. We’ve designed the JCB JS145 tracked excavator to be comfortable, safe, ergonomic, simple and intuitive to operate. Which is good for operators of 360 excavators but even better for you; after all, great ease of use equals great productivity. A 70/30 front screen split for a clear view of the front right track, plus a large laminated glass roof window provide this 14.5 ton excavator with exceptional all-round visibility. To keep everything under control, JCBJS145 tracked excavators have a balanced slew and electronic/hydraulic controlled slew braking. Function switches are easy to reach and include the heater and climate control panels, while the side unit doubles as part of the immobilizer code selector. JCB JS145s have spacious storage behind the operator’s seat. A new SMART controller keeps tabs on functions and inputs during different working modes. A large floor area with large high grip pedals gives easy and precise tracking. Demist/defrost keeps a JS145 front window clear. 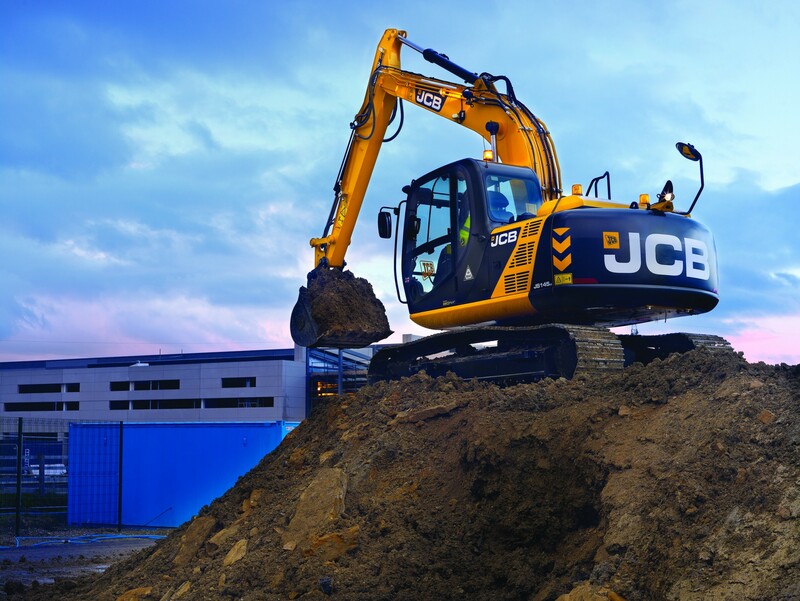 We’ve designed JCB JS145 tracked excavators to be low maintenance and easily serviceable. Which makes them affordable, efficient and highly productive. Bonnets open and close easily with gas-assisted cylinders, and the service bays are large and wide for good access. 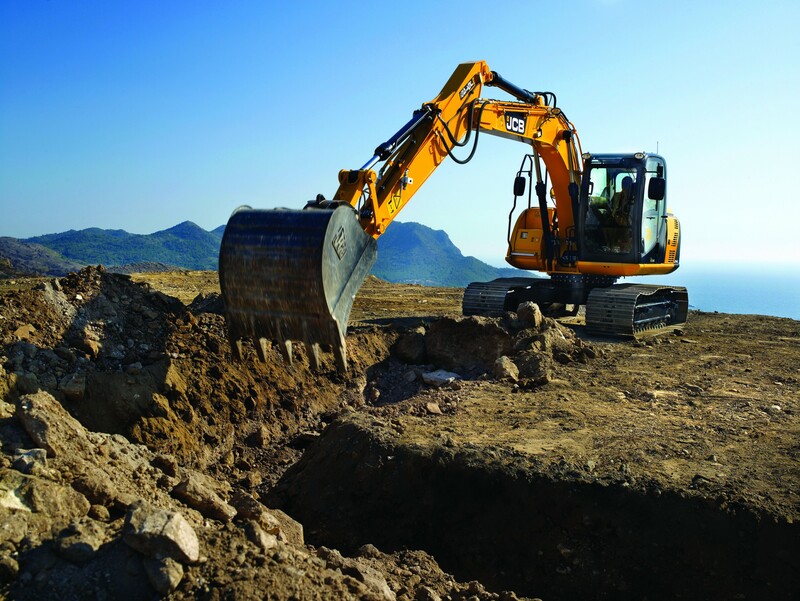 1000-hour boom and dipper greasing intervals and a 5000-hour oil life provide maximum uptime on these 360 excavators. Grease points are centralized on a JS145, for safe and easy access to high level pivots. Likewise filters (engine oil, hydraulic oil and fuel). Because they’re mounted side by side, the JS145 tracked excavator’s engine radiator, hydraulic cooler and intercooler can be serviced individually and cleaned easily. Meanwhile, this 17 ton excavator is powered by a highly efficient Tier 4 Final compliant JCB EcoMAX engine. It provides a fuel saving of up to 9% over our outgoing models. The benefits of the JS160 series of tracked excavators don’t end there either. Before you buy tracked excavators, you need to know they’re going to be tough enough to perform any job you ask of it. Fortunately, with a JCB JS160, strength and durability come as standard. We use Finite Element Analysis with extensive rig and endurance testing to make these 360 excavators last longer. A JCB JS160’s reinforced boom and dipper is made of high tensile strength steel, with single piecewrapper plates and internal baffle plates for long life durability. The turret on JS160 tracked excavators is then welded to both the upper and lower undercarriage frames, and stiff, durable doors provide further strength. It’s more important than ever to save money and time so it’s just as well that JCB JS160 tracked excavators are designed to make the most of both. Our Tier 4 Final compliant EcoMAX motor produces high torque at low revs for great efficiency. There’s a massive 97 kN bucket tearout for superb productivity, and the JCB JS range quickhitch system makes attachment changing fast and easy. We’ve designed the JCB JS160 tracked excavator to be comfortable, safe, ergonomic, simple and intuitive to operate. Which is good for operators of 360 excavators but even better for you; after all, great ease of use equals great productivity. A 70/30 front windshield split for a clear view of the front right track, plus a large laminated glass roof window provide this 17 ton excavator with exceptional all-round visibility. To keep everything under control, JS160 tracked excavators have a balanced slew and electronic/hydraulic controlled slew braking. Function switches are easy to reach and include the heater and climate control panels, while the side unit doubles as part of the immobilizer code selector. Demist/defrost keeps a JS160 front window clear. We’ve designed JCB JS160 tracked excavators to be low maintenance and easily serviceable. Which makes them affordable, efficient and highly productive. Hoods open and close easily with gas-assisted cylinders, and the service bays are large and wide for good access. 1000-hour boom and dipper greasing intervals and a 5000-hour oil life provide maximum uptime on these 360 excavators. Grease points are centralized on a JS160 17 ton excavator too, for safe and easy access to high level pivots. Likewise filters (engine oil, hydraulic oil and fuel). Because they’re mounted side by side, the JS160 tracked excavator’s engine radiator, hydraulic cooler and intercooler can be serviced individually and cleaned easily. The JCB JS190 is in the 19.5 ton category of our range of heavy tracked excavators. It’s engineered with exceptional strength, productivity, efficiency, comfort, safety and ease of maintenance. Meanwhile, this excavator is powered by the highly efficient Tier 4 Final compliant JCB EcoMAX engine. The benefits of the JS190 series of tracked excavators don’t end there either. It’s more important than ever to save money and time so it’s just as well that JCB JS190 tracked excavators are designed to make the most of both. 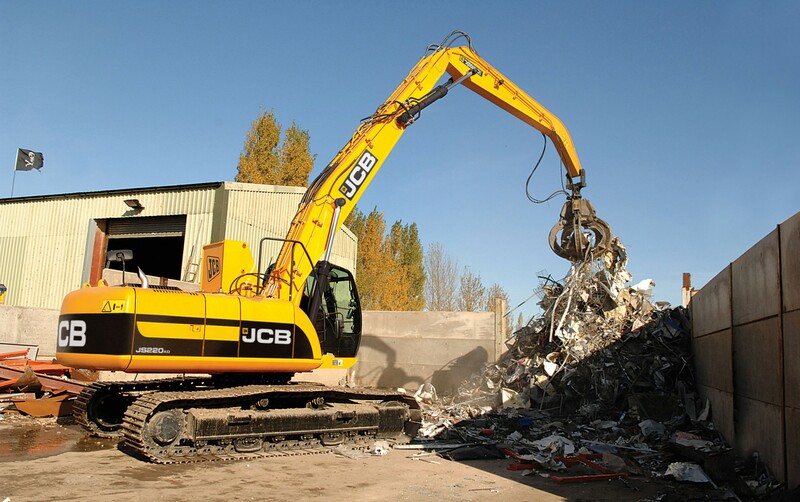 Our Tier 4 Final compliant JCB EcoMAX motor produces high torque at low revs for great efficiency. There’s a massive 97kN bucket tearout for superb productivity, and the JCB JS range quickhitch system makes attachment changing fast and easy. A 70/30 front windshield split for a clear view of the front right track, plus a large laminated glass roof window provide this 19.5 ton excavator with exceptional all-round visibility. To keep everything under control, JCB JS190 tracked excavators have a balanced slew and electronic/hydraulic controlled slew braking. Function switches are easy to reach and include the heater and climate control panels, while the side unit doubles as part of the immobilizer code selector. JCB JS190s have a spacious storage behind the operator’s seat. Demist/defrost keeps a JS190 front window clear. We’ve designed JCB JS190 tracked excavators to be low maintenance and easily serviceable. Which makes them affordable, efficient and highly productive. Hoods open and close easily with gas-assisted cylinders, and the service bays are large and wide for good access. 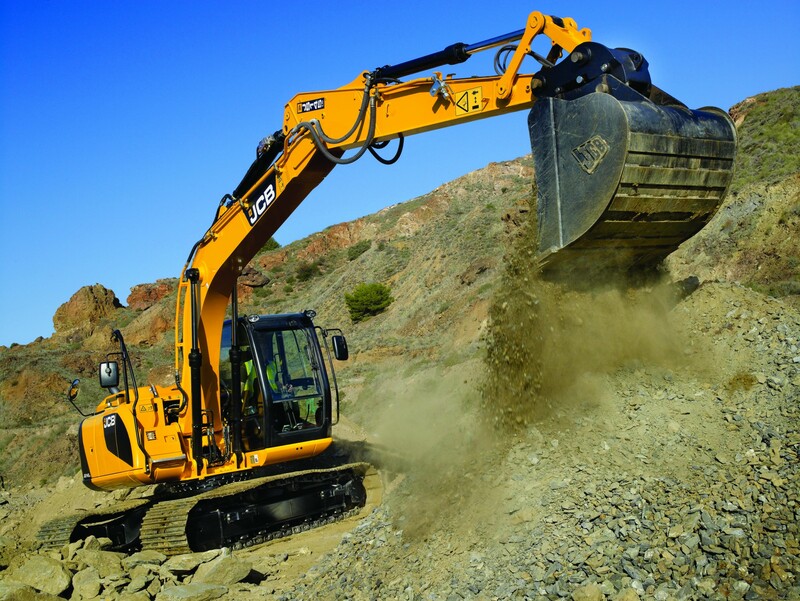 1000-hour boom and dipper greasing intervals and a 5000-hour oil life provide maximum uptime on these 360 excavators. Grease points are centralized on a JS190 19.5 ton excavator too, for safe and easy access to high level pivots. Likewise filters (engine oil, hydraulic oil and fuel). Because they’re mounted side by side, the JS190 tracked excavator’s engine radiator, hydraulic cooler and intercooler can be serviced individually and cleaned easily. The JCB JS220 sits at the top of our range of heavy tracked excavators. Weighing in at around 22 tons, it’s engineered with exceptional strength, productivity, efficiency, comfort, safety and ease of maintenance. Meanwhile, this 22 ton excavator is powered by a highly efficient JCB EcoMAX Tier 4 Final compliant engine which provides superb reliability and productivity. The benefits of the JS220 series of tracked excavators don’t end there either. Before you buy tracked excavators, you need to know they’re going to be tough enough to perform any job you ask of it. Fortunately, with a JCB JS220, strength and durability come as standard. We use Finite Element Analysis with extensive rig and endurance testing to make these 360 excavators last longer. A JCB JS220’s reinforced boom and dipper is made of high tensile strength steel, with single piecewrapper plates and internal baffle plates for long life durability. The turret on JS220 tracked excavators is then welded to both the upper and lower undercarriage frames, and stiff, durable doors provide further strength. It’s more important than ever to save money and time so it’s just as well that JCB JS220 tracked excavators are designed to make the most of both. Our Tier 4 Final compliant EcoMax engine has a high power rating of 173 hp (129 kW); yet, because it produces high torque at low revs, it’s very efficient too. A massive 33,510 lbf (149kn) bucket tearout makes the JS220 excavator highly productive, and the JCB JS range quickhitch system makes attachment changing fast and easy. Simultaneous tracking and excavating is smooth and fast with an intuitive multifunction operation, and four operating work modes allow a JS220 20 ton excavator operator to tailor performance to any application. Auto, Economy, Precision and Lifting modes provide very different optimized settings. We’ve designed the JCB JS220 tracked excavator to be comfortable, safe, ergonomic, simple and intuitive to operate. Which is good for operators of 360 excavators but even better for you; after all, great ease of use equals great productivity. To keep everything under control, JCB JS220 tracked excavators have a balanced slew and electronic/hydraulic controlled slew braking. Function switches are easy to reach and include the heater and climate control panels, while the side unit doubles as part of the immobilizer code selector. JCB JS220s have a spacious storage tray behind the operator’s seat. Demist/defrost keeps a JS220 front window clear. We’ve designed JCB JS220 tracked excavators to be low maintenance and easily serviceable. Which makes them affordable, efficient and highly productive. Because they’re mounted side by side, the JS220 tracked excavator’s engine radiator, hydraulic cooler and intercooler can be serviced individually and cleaned easily.